Left: A transparent-green chlorophyll solution of ground up spinach leaves and acetone. Right: Beam of light directed at the chlorophyll solution producing a reddish glow called fluorescence. A transparent-green chlorophyll solution can be made by grinding up spinach leaves or grass with acetone in a mortar and pestle. The solution is then filtered through cheesecloth and coarse filter paper to remove the impurities and debris. Chlorophyll molecules impart the green color to the solution; however, the actual chloroplasts and thylakoid membranes have been dissolved. When a bright beam of light is directed at the chlorophyll solution in the test tube, it gives off a reddish glow. This phenomenon is known as fluorescence. The chlorophyll electrons become excited by the light energy, but have no cytochrome transport system to flow along because the chloroplast thylakoid membranes have been dissolved away. Therefore, the chlorophyll electrons give up their excited energy state by releasing energy in the form of a reddish glow. This is essentially the same phenomenon as a neon light, except the electrons of neon gas molecules in the glass tube become excited and then release their energy as a white glow. Illustration of a mitochondrion. The inner membrane forms a series of inwardly-projecting folds called cristae. Electrons from glucose are shuttled through a cytochrome transport system along the membranes of the cristae. During this electron transport process, ATP is generated by a complex chemical mechanism known as chemiosmosis. Most of the ATP in animal cells is generated within the mitochondria. Plants can also generate ATP by a similar mechanism along thylakoid membranes of their chloroplasts. The structure of adenosine monophosphate, an RNA nucleotide containing the purine base adenine, is very similar to ATP (adenosine triphosphate), except that ATP has three phosphates (PO4) instead of one. ATP is synthesized in all living cells by the addition of a phosphate to ADP (adenosine diphosphate). ATP is the vital energy molecule of all living systems which is absolutely necessary for key biochemical reactions within the cells. The terminal (3rd) phosphate of ATP is transferred to other molecules in the cell, thereby making them more reactive. For example, the monosaccharide glucose is very stable at ordinary body temperatures and would require a great amount of heat (such as from a flame) to break it down into carbon dioxide and water. After receiving a phosphate from ATP (a process called phosphorylation), glucose becomes glucose-phosphate and can be enzymatically broken down within seconds. Most of the ATP in eukaryotic cells of animals is made inside cellular organelles called mitochondria from the oxidation of glucose, a process called cellular respiration. Glucose combines with oxygen (oxidation), forming carbon dioxide, water and 38 molecules of ATP. During the oxidation process, electrons from glucose are shuttled through an iron-containing cytochrome enzyme system on the inner mitochondrial membranes (called cristae). The actual synthesis of ATP from the coupling of ADP (adenosine diphosphate) with phosphate is very complicated and involves a mechanism called chemiosmosis. The electron flow generates a higher concentration (charge) of positively-charged hydrogen (H+) ions (or protons) on one side of the membrane. When one side of the membrane is sufficiently "charged," these protons recross the membrane through special channels (pores) containing the enzyme ATP synthetase, as molecules of ATP are produced. The detailed, step-by-step breakdown of glucose during cellular respiration is called the Krebs Cycle or Citric Acid Cycle. Illustration of a chloroplast showing the outer and inner layers of the phospholipid bilayer membrane. Each stack of thylakoid disks represents one granum. The light reactions of photosynthesis occur in the grana. The area between the grana is called the stroma. This is where the dark reactions of photosynthesis occur. In the light reactions, excited electrons from chlorophyll flow through a cytochrome transport system along membranes of the thylakoid disks (thylakoid membranes). During this electron transport process, ATP and NADPH2 are generated. In the dark reactions of the stroma, CO2 is gradually converted into glucose through a series of reactions called the Calvin Cycle. In addition to mitochondrial ATP synthesis, plants can also make ATP by a similar process during the light reactions of photosynthesis within their chloroplasts. Electrons flow through a cytochrome transport system on thylakoid membranes in a region of the chloroplast called the grana; except that the electrons come from excited (light activated) chlorophyll molecules rather than the break down of glucose. This is an especially vital source of ATP for plants because ATP is also needed for them to synthesize glucose in the first place. Without a photosynthetic source of ATP, plants would be using up their ATP to make glucose, and then using up glucose to make ATP, a "catch-22" situation. 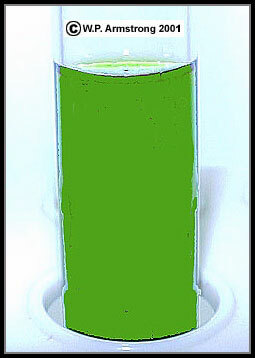 A transparent-green solution of chlorophyll is made by grinding up spinach or grass leaves in acetone (in a mortar and pestle), and then filtering it through cheesecloth and course filter paper. 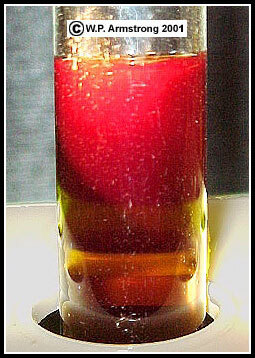 When a bright beam of light is directed at this chlorophyll solution, a deep red glow is emitted from the test tube. The chlorophyll electrons become excited by the light energy, but have no cytochrome transport system to flow along because the chloroplast thylakoid membranes have been dissolved away. Therefore, the chlorophyll electrons give up their excited energy state by releasing energy in the form of a reddish glow. This phenomenon is known as fluorescence, and is essentially the same principle as a fluorescent light bulb. In a fluorescent light bulb, the electrons of neon gas become excited and then release their energy of activation as a white glow inside the glass tube. In an intact chloroplast with thylakoid membranes, ATP is generated by an electron flow along the cytochrome transport system. Since the electrons are being transported to other "carrier" molecules, their energy is used to generate ATP and no reddish glow is emitted. Leaves generally appear green because wavelengths of light from the red and blue regions of the visible spectrum are necessary to excite the chloroplast electrons, and unused green light is reflected. Thus, we perceive trees, shrubs and grasses as green. During the fall months when chlorophyll production ceases in deciduous trees and shrubs, the leaves turn golden yellow or red due to the presence of other pigments, such as yellow and orange carotenoids and bright red anthocyanins. Another important ingredient for photosynthesis is also produced during the light reactions. During these light-dependent reactions of photosynthesis, a chemical called NADP (nicotinamide adenine dinucleotide phosphate) picks up two hydrogen atoms from water molecules forming NADPH2, a powerful reducing agent that is used to convert carbon dioxide into glucose during the dark reactions of photosynthesis (also called the Calvin Cycle). When the two atoms of hydrogen join with NADP, oxygen is liberated, and this is the source of oxygen gas in our atmosphere. ATP and NADPH2from the light reactions are used in the dark reactions of photosynthesis that take place in the stroma region of the chloroplast. NADP (the vital coenzyme required for photosynthesis) is derived from nicotinic acid, a B-vitamin also known as niacin. Niacin prevents pellagra, a disease characterized by severe damage to the tongue, skin and digestive tract. [NAD is another vital coenzyme that carries electrons to the electron transport system in mitochondria.] Nicotine, the alkaloid in tobacco responsible for its highly addictive properties, is also derived from nicotinic acid. Nicotine is a mild stimulant of the central nervous system. In its pure form, nicotine is highly poisonous and is used as an insecticide. Note: The oxygen liberated during the light reactions of photosynthesis comes from water. Some plants adapted to hot, arid regions have a different photosynthetic mechanism called CAM photosynthesis. CAM (Crassulacean Acid Metabolism) photosynthesis is found in cacti and succulents, including the crassula family (Crassulaceae). During the hot daylight hours their stomata are tightly closed; however they still carry on vital photosynthesis as carbon dioxide gas is converted into simple sugars. During the cooler hours of darkness their stomata are open and CO2 enters the leaf cells where it combines with PEP (phosphoenolpyruvate) to form 4-carbon organic acids (malic and isocitric acids). The 4-carbon acids are stored in the vacuoles of photosynthetic cells in the leaf. During the daylight hours the 4-carbon acids break down releasing CO2 for the dark reactions (Calvin cycle) of photosynthesis inside the stroma of chloroplasts. The CO2 is converted into glucose through a series of complicated reactions involving ATP (adenosine triphosphate) and NADPH2 (nicotinamide adenine dinucleotide phosphate), the latter two compounds which were synthesized during the light reactions of daylight in the grana of chloroplasts. 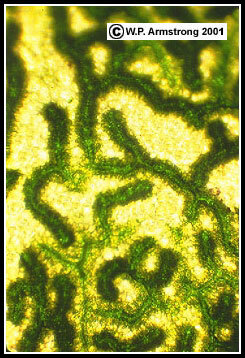 The adaptive advantage of CAM photosynthesis is that plants in arid regions can keep their stomata closed during the daytime, thereby reducing water loss from the leaves through transpiration; however, they can still carry on photosynthesis with a reserve supply of CO2 that was trapped during the hours of darkness when the stomata were open. The tropical strangler Clusia rosea also has CAM photosynthesis. This unusual tree starts out as an epiphyte on other trees and then completely envelops and shades out its host. In fact, it greatly resembles strangler figs (Ficus) of tropical regions of the world. Another interesting modification of the photosynthetic pathway is called C-4 Photosynthesis. During C-4 photosynthesis, CO2 combines with phosphoenolpyruvate (PEP) to form a 4-carbon organic acid (oxaloacetic acid) which migrates (diffuses) to the photosynthetic bundle sheath cells surrounding the vascular bundles (veins) of the leaf. PEP essentially shuttles the CO2 to the bundle sheath cells where it is released for the dark reactions (Calvin cycle) of photosynthesis. During hot weather the CO2 level inside leaves is greatly reduced because the leaf stomata are closed. In ordinary C-3 plants which form a 3-carbon compound (PGA) during the initial steps of the dark reactions, photosynthesis in the leaf shuts down without a sufficient supply of CO2. C-4 plants have a competitive advantage during hot summer days because they are able to carry on photosynthesis in the bundle sheaths where CO2 levels are concentrated. Weedy C-4 plants such as Bermuda grass, spurges and purslane grow rapidly during hot summer days, while photosynthesis and growth in C-3 plants shuts down. Left: Purslane (Portulaca oleracea), a European herbin the purslane family (Portulacaceae) that is naturalized throughout southern California. Although it is considered a weed to most gardeners, it actually makes a tasty steamed vegetable. Right: Close-up view of a purslane leaf showing the prominent green veins. 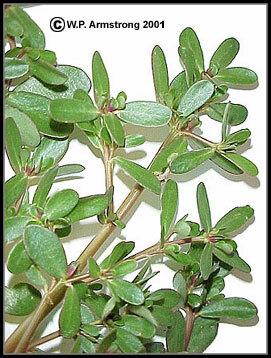 Purslane is a classic C-4 plant in which the chloroplasts are concentrated in bundle sheath cells surrounding the veins. Similar electron transport systems occur in the membranes of prokaryotic bacteria. Methanogenic bacteria live in marshes, swamps and your gastrointestinal tract. In fact, they are responsible for some intestinal gas, particularly the combustible component of flatulence. They produce methane gas anaerobically (without oxygen) by removing the electrons from hydrogen gas. The electrons and H+ ions from hydrogen gas are used to reduce carbon dioxide to methane. In the reaction, the H+ ions combine with the oxygen from carbon dioxide to form water. During this process, the electrons are shuttled through an anaerobic electron transport system within the bacterial membrane which results in the phosphorylation of ADP (adenosine diphosphate) to form ATP (adenosine triphosphate). This process is much less efficient than aerobic respiration, so only two molecules of ATP (rather than 38) are formed. Desert varnish bacteria make their ATP in a similar fashion, only the electrons are coming from the aerobic oxidation of iron and manganese. A thin coating of iron or manganese oxide is deposited on the surfaces of desert boulders and rocky slopes. During the oxidation process, the electrons are shuttled through an iron-containing cytochrome enzyme system on the inner bacterial membrane. One has only to gaze at the spectacular panoramas of varnish-coated, granitic boulders throughout desert areas of the American southwest to appreciate the magnitude of this bacterial ATP production. The mechanism of ATP synthesis in prokaryotic bacteria is remarkably similar to eukaryotic cells. In addition, the circular DNA molecules of these bacteria are similar to the DNA molecules within some organelles of eukaryotic cells. In fact, some biologists believe that mitochondria and chloroplasts within eukaryotic animal and plant cells may have originated from ancient symbiotic bacteria that were once captured by other cells in the distant geologic past. This fascinating idea is called the "Endosymbiont Theory" (or "Endosymbiont Hypothesis" for those who are more skeptical). Archaebacteria: Possible Life Form On Mars? The leaf surface of a species of Tradescantia, also known as spiderwort (Commelinaceae), a plant that is commonly grown in hanging baskets. 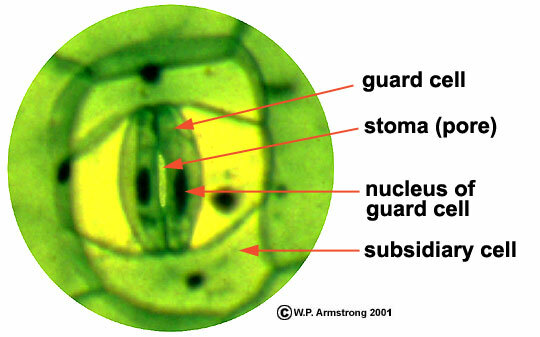 Note the paired guard cells and stoma (opening slit) between them (circled in red). Also note the scattered hairs (trichomes). Each hair arises from a pedestal-like basal cell containing a nucleus. 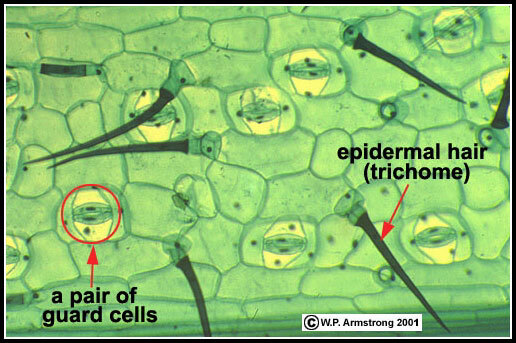 Microscopic view of the paired guard cells and stoma on the leaf surface of spiderwort (Tradescantia). An opening or stoma develops between the inflated (turgid) guard cells due to a differential thickening of their walls. When the guard cells lose water pressure on a hot day, they deflate and push together, thus closing off the stoma and reducing water loss (transpiration) through the leaf.